Pentax has created a versatile dSLR model that is sure to please a wide range of photographers. With a durable weather, dust, and cold resistant shell, the K-7 is ready for action no matter what the environment may be. Read more in our Full Conclusion. 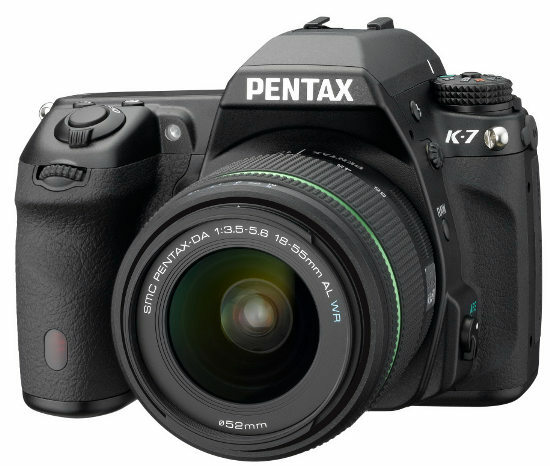 The K-7 is Pentax's latest K-series model, featuring all of the options and technologies we have come to enjoy from this rugged line of enthusiast to professional level dSLRs. The K-7 improves upon the foundation laid by its predecessors, the K20D and K10D. With a similar feature set, this new model boasts several improvements, like a newly designed 14.6-megapixel CMOS sensor, Pentax's latest PRIME II processing unit, 77-segement metering system, broadened shutter speed range, HD video recording with automatic or manual aperture control, and much more. The K-7 body only kit has a MSRP of $1,299.95 US, and is available now.